The Henrico Wolfpack is proud to announce we will have basketball teams from the 4th grade up to be 12th grade. Last year we expanded to middle school boys and this year we want to offer services to as many kids as we can. So if you are interested in your child being a part of the Pack.​ Contact us today! 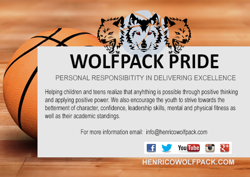 The Henrico Wolfpack is a non-profit organization formed to help the youth in Eastern Henrico County, VA and the surrounding areas with various aspects of their lives. The organization focuses on building character, confidence, and leadership skills in youth, ages 7 to 18 through physical fitness in Amatuer Athletic sports programs. The Wolfpack not only offers young men an opportunity to play basketball but we also offer an avenue for mentoring and encouragement of volunteerism in the community.